Kit includes two aluminum skates and all necessary parts and hardware. Skates are aircraft-quality aluminum with stainless steel inserts and hardened steel ball bearings. One kit is required for each mobile unit. Shelves and posts not included. 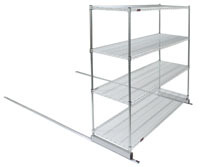 Note: When assembling with shelf unit, add 1" to width and length of shelf unit. SDSK-18 18" single-deep skate kit for floor-trak systems. SDSK-21 21" single-deep skate kit for floor-trak systems. SDSK-24 24" single-deep skate kit for floor-trak systems. SDSK-30 30" single-deep skate kit for floor-trak systems. SDSK-36 36" single-deep skate kit for floor-trak systems.